The international 'appeasement policy' permitted Hitler the annexation of Austria as 'Gau Ostmark', and the entry of German troops in Czechoslovakia. Hitler's 'Wehrmacht' began the 2nd World War in the autumn of 1939 with the assault of Poland. After a few weeks Poland was occupied and the 'Blitzkrieg' continued with the military campaign in the west. 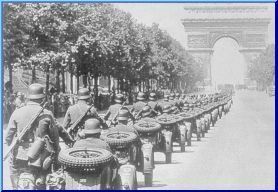 The occupation of France began in Spring 1940 and this preceeded the campaign 'Barbarossa', the subjugation of the Soviet Union. Once the strategically important Scandinavia occupied, the attack of the Soviet Union - Hitler's very target of war - could be undertaken; the Baltic states were quickly run over but the extensive raid of the German armies was stopped by the early winter of 1941 before Moscow. With the United States entering the war and the counter-attack of Stalin's 'Red Army', the defeat of the Nazism begun and with it the end of the dream of a pangerman empire. Here you can find a very large choice of the german occupation stamps, issued during World War II.